River Heralds' Boon (Segen der Flussherolde) inkl. 0% MwSt. 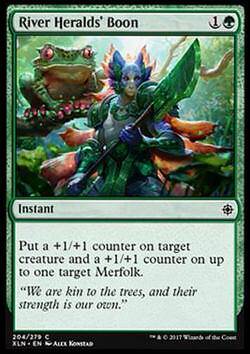 Regeltext: Put a +1/+1 counter on target creature and a +1/+1 counter on up to one target Merfolk. Flavourtext: ""We are kin to the trees, and their strength is our own.""